Every year my nieces have a father daughter dance for Valentines day. Each dance has a different unique theme. This year the theme was a 50’s sock hop! 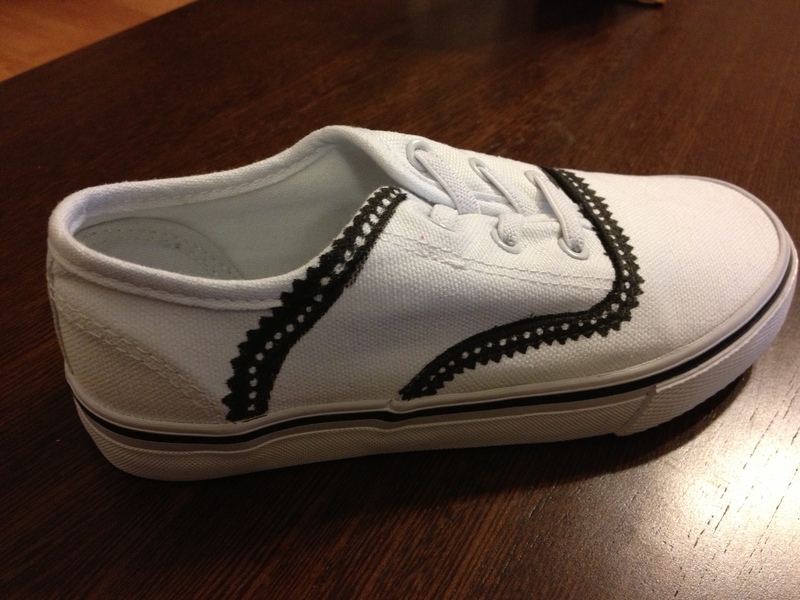 Recently, a friend of mine sent me a link to a pair of keds that had been drawn on with a Sharpie to look like Oxfords. I was dying to try it out myself! And what better excuse than Saddle Locks for my nieces dance. I took a few pictures along the way so that you could try the look out for yourself! 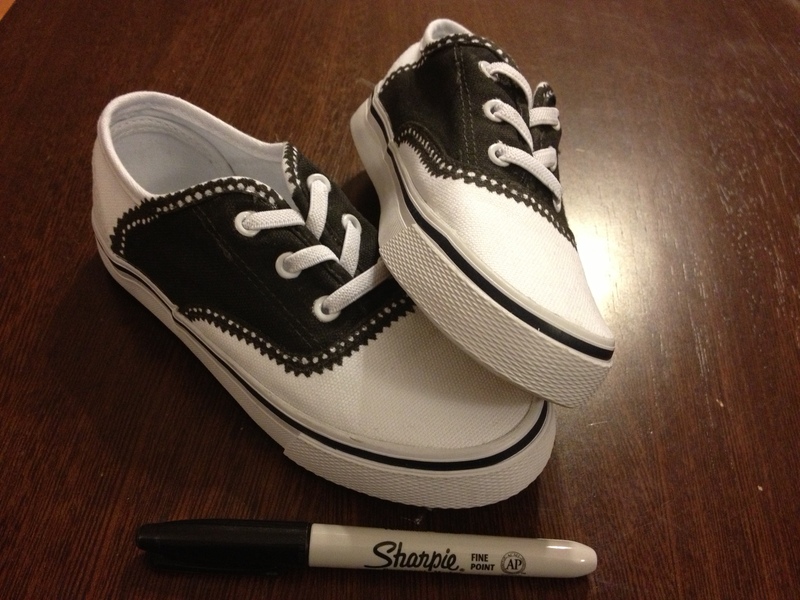 Getting started…All you’ll need is a Sharpie and a pair of fresh white kicks! 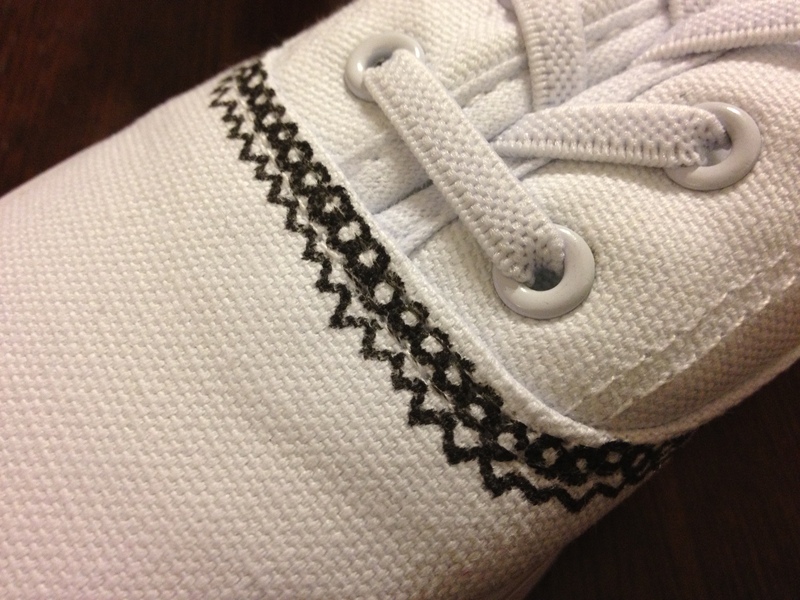 I started by adding the circles and zigzags that begin the design. Once I finished the out line, all that was left was to fill in the space in between. 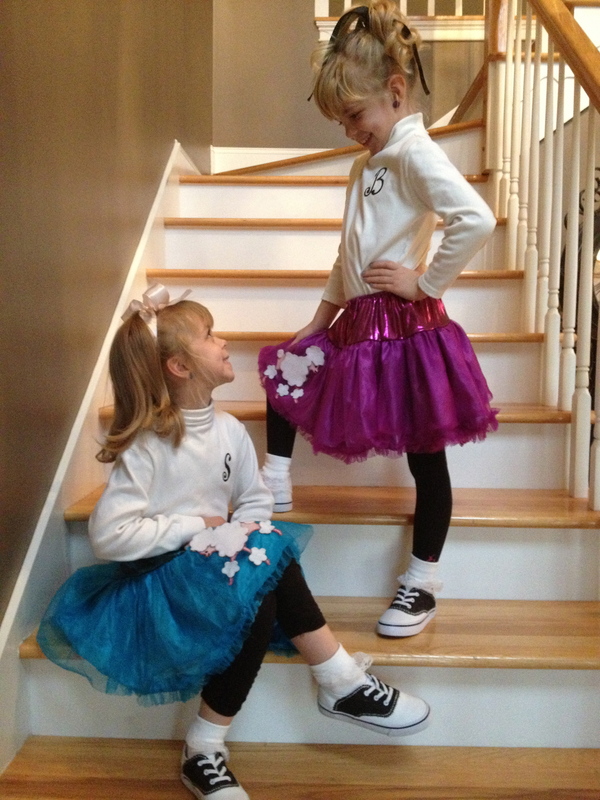 All ready for the sock hop!! Tonight was the first time I’ve tried to sell my shabby chic creations. We had a bizarre at my church and it went over really well. 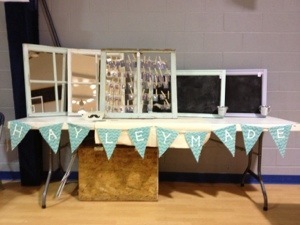 Here’s a look at my booth! I made the canvas “hayleymade” banner just for the occasion and I absolutely love it! 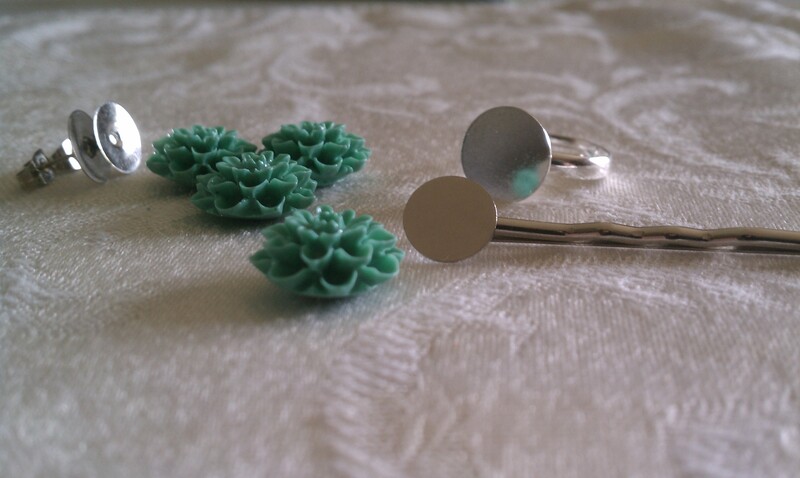 I’ve recently noticed a huge trend in earrings and bobby pins adorned with handmade clay objects. I started looking for them a few months ago and realized they were outrageously priced. I decided it would be cheaper and way more fun if I made my own. I just recently purchases a few molds on Etsy from Mold Muse and thought I’d show you a few things that could be made with them! Here are a few clay Chrysanthemums and all of the things I needed to turn them into something special. 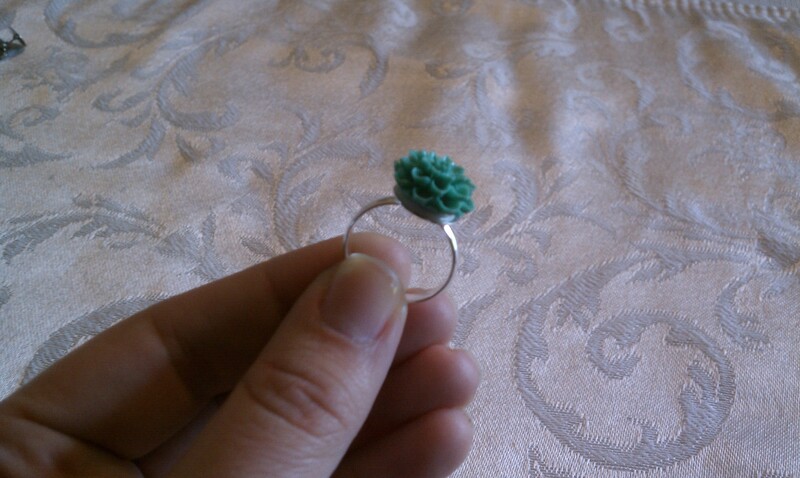 Once you have the Chrysanthemums, all you need is glue and whatever base you want to glue it to! 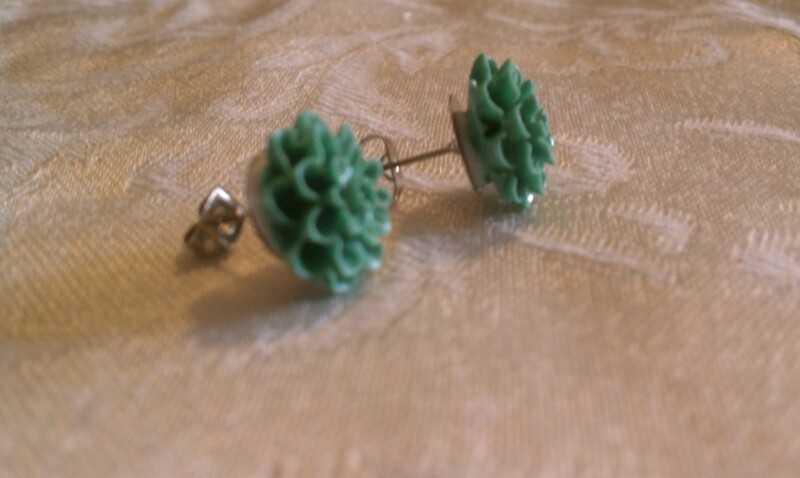 and earrings! So easy, it’s ridiculous…and pretty inexpensive. Last night, while watching the Olympics, my dad pointed out that one of the American Gymnasts was wearing earrings made out of buttons. We both thought it was pretty much awesome and he practically dared me to make a pair. I decided to take his challenge and see what I could do. I took pictures along the way so you could try as well! 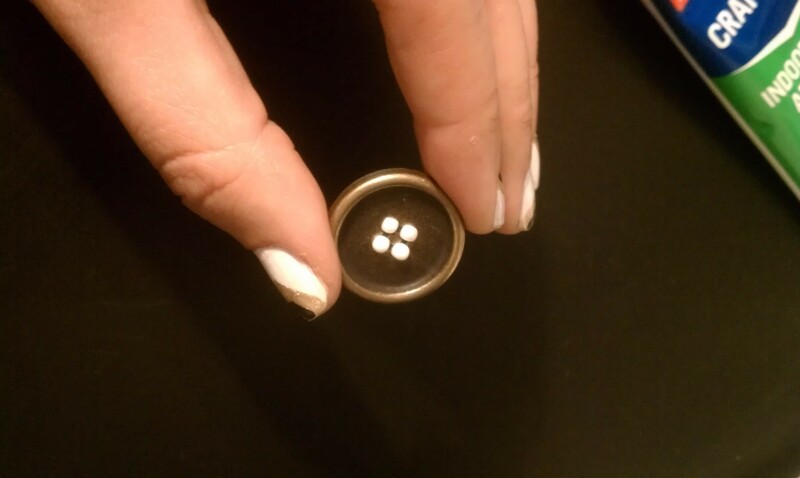 Ever wonder what to do with the extra buttons that come on your blouses? Well now you know, these two came as spares with my favorite blazer. 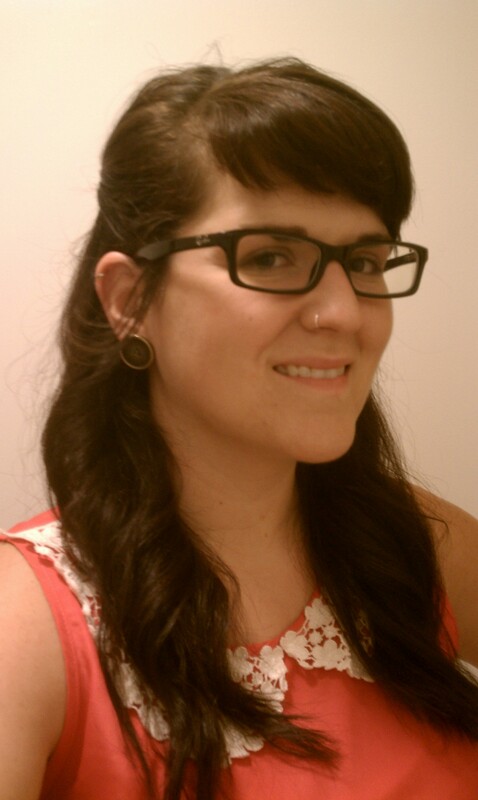 I chose them because I really loved the idea of having matching earrings! 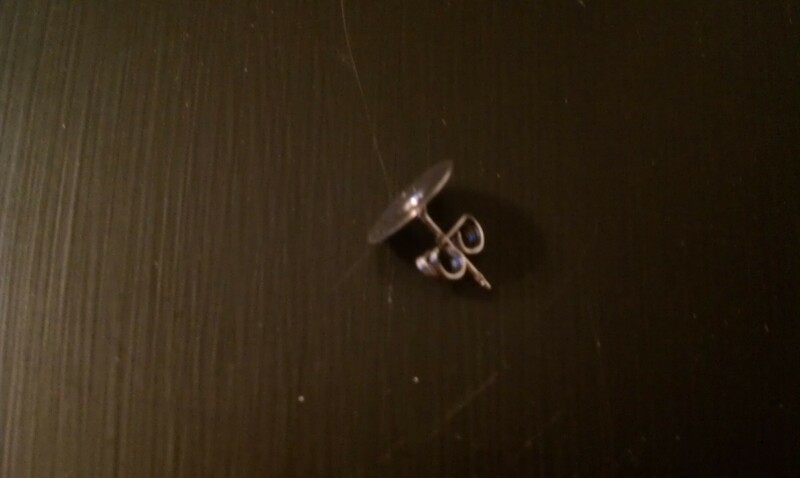 In order to make these earrings you’ll need earring posts with a flat base, strong craft glue. 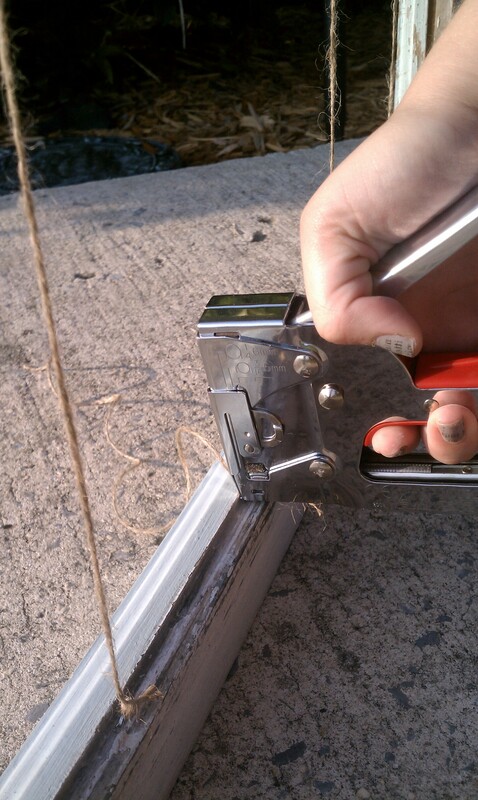 (Helpful hint: check that the glue works with metal and plastic.) 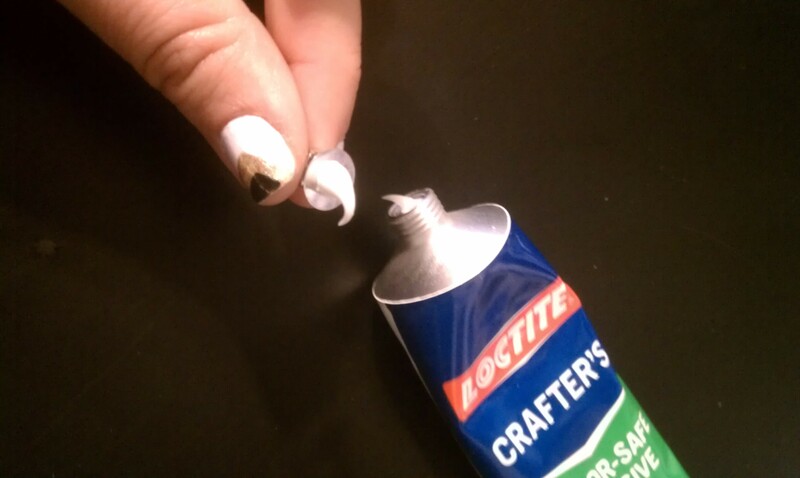 I used Loctite’s Crafter’s Glue. This is an extremely easy project. First, I applied enough glue to cover the base. Then I lightly pressed the button onto the post. This step will cause glue to come up through the button holes. 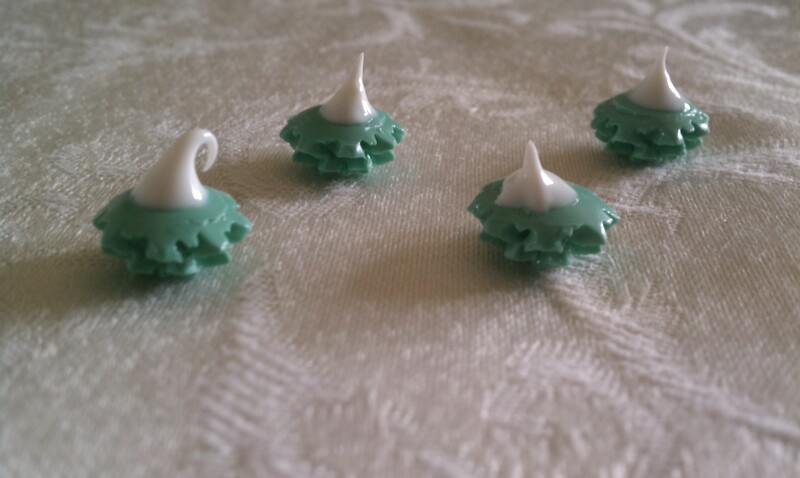 If you’re afraid your earrings will look funny, you can wipe away the excess glue. I let the glue dry this way for extra hold. 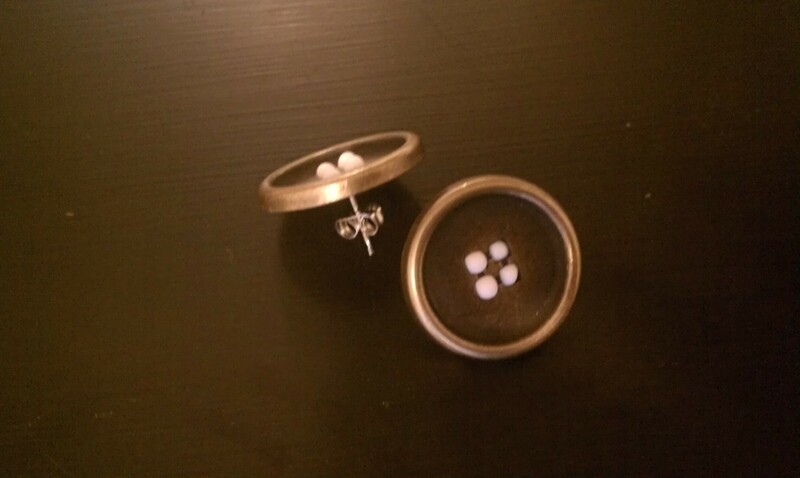 Once I had both buttons attached to their bases, I allowed them to try over night. You probably won’t have to wait that long; but, I thought better safe than sorry. 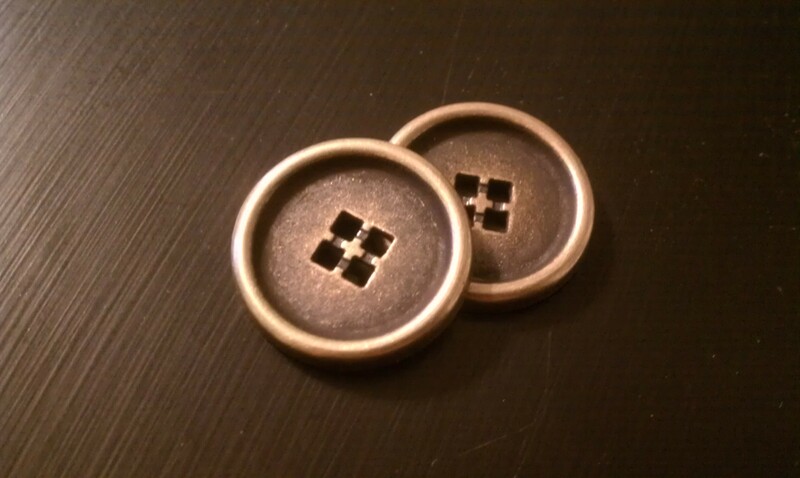 I’d hate to try them on before they were completely dry and have permanent button earrings! What do you think? I hope you will also try your hand at this simple craft! I’ve been thinking of neat easy ways to do my nails lately. Today I decided I’d us three of my favorite colors to create my favorite shape for a hip new look. 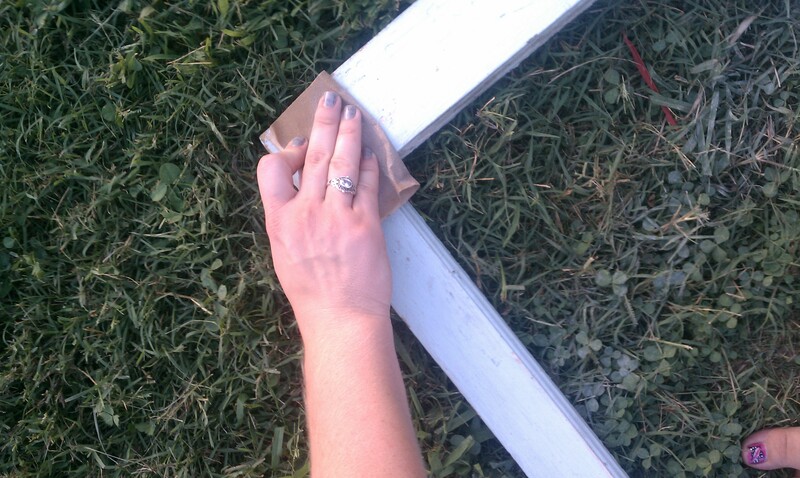 For this easy look, you’ll need: Three colors and a steady hand…or tape of you’re afraid you can’t paint a triangle. 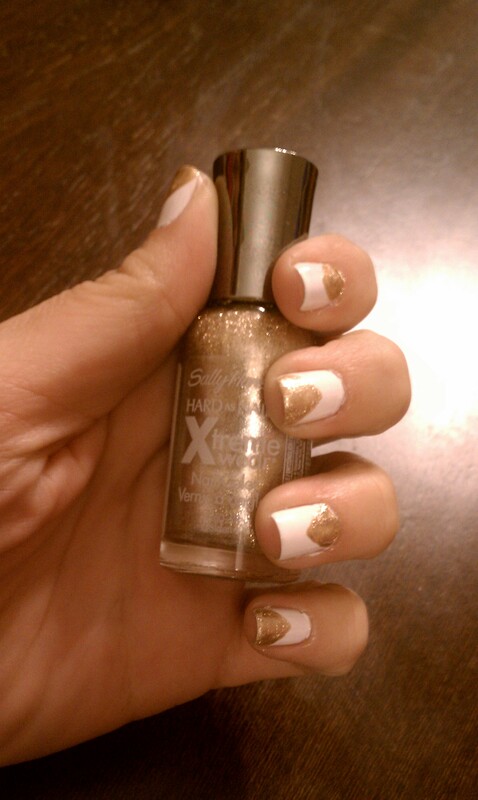 I tried the tape but was too impatient and tore of my white polish…therefore, I decided to paint the triangles by hand. After the base coat is completely dried, you’ll use the second color to paint a large triangle that will take up half of your nail. I did every other nail with a triangle at the top and a triangle on the tip. 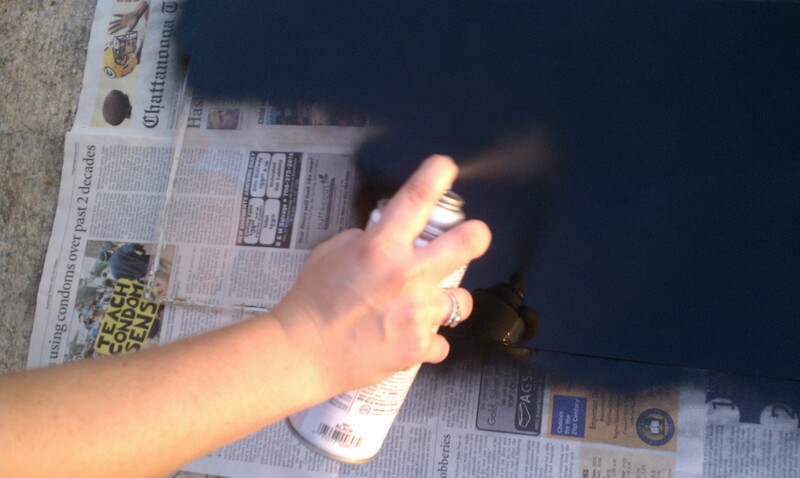 Once the second coat is completely dried, you can ad the smallest triangles. 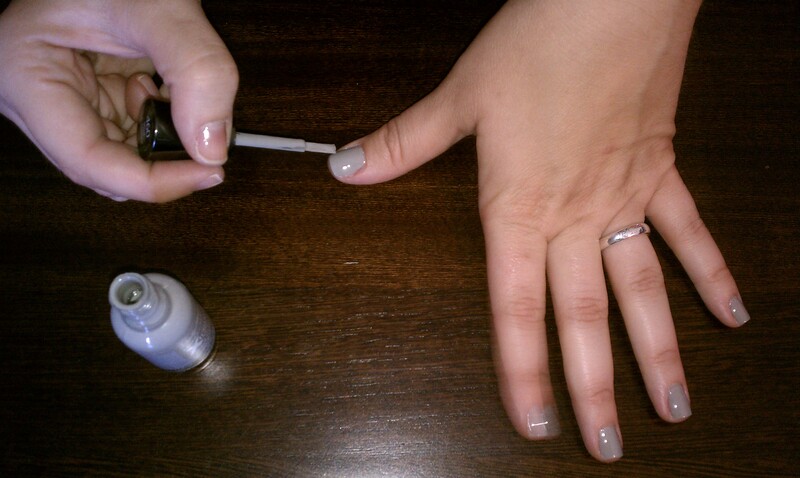 To finish the look, top with a clear coat! 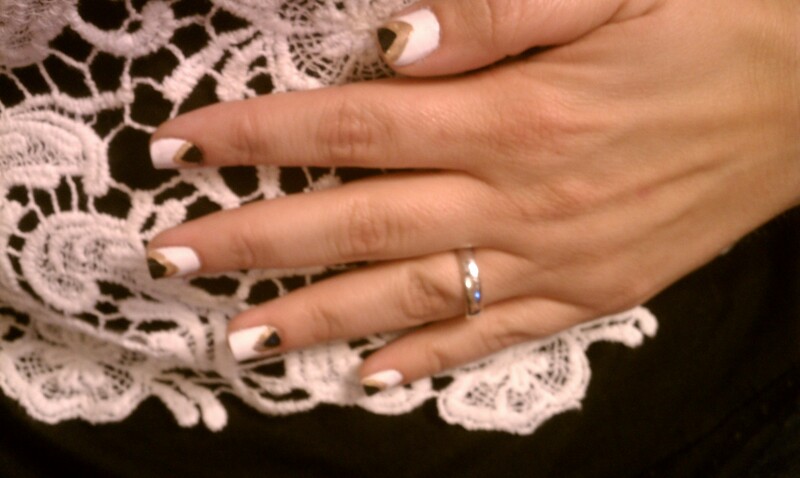 Keep a lookout, next up…marble nails and upon request, OWLS! 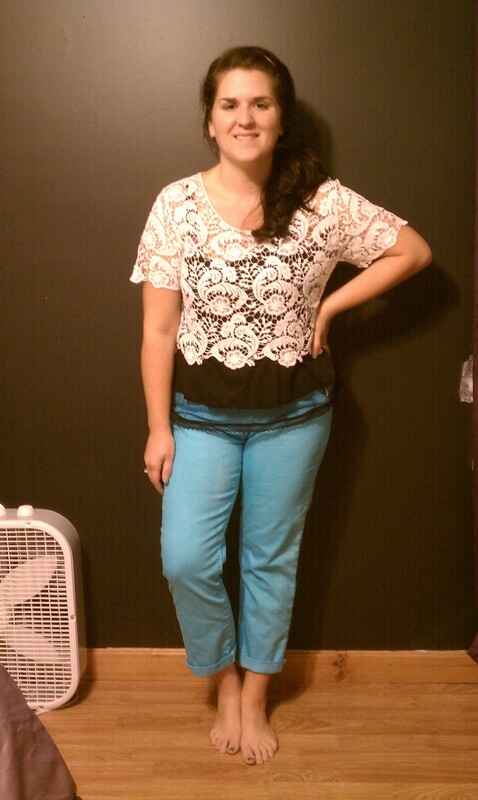 Colored Skinny Jeans Are In! 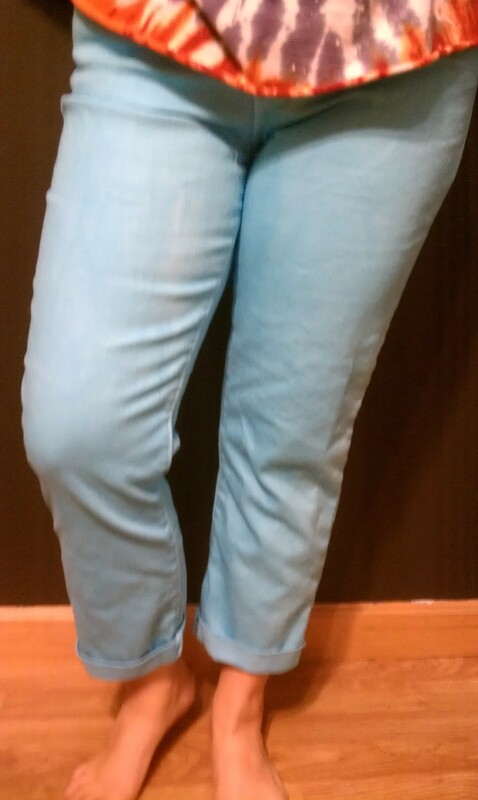 So, I’ve been wanting a pair of mint/turquoise skinny jeans…since I absolutely couldn’t find them anywhere, I decided to take matters into my own hands. 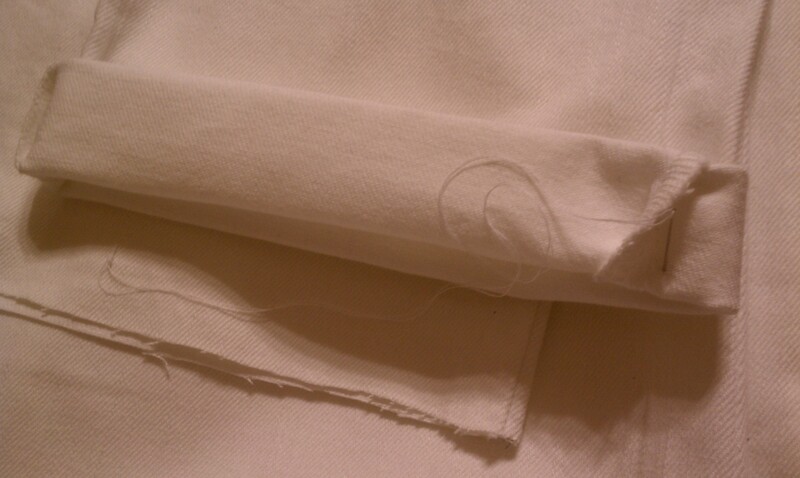 Things you’ll need: An old pair of jeans, bleach(if they aren’t already white), needle and thread and dye. Here are a few pictures to show you my process. If you have any questions on the method just leave me a comment! The first step is finding the perfect pair of jeans, or maybe just a pair you never wear. 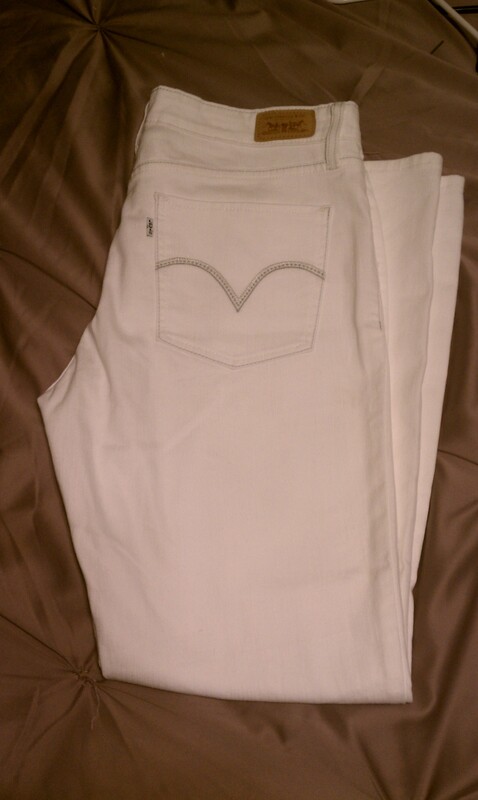 For me it was these white jeans. I have no idea why I bought them, except that they were on super sale, either way I never wear them and since they are white, it just makes things easier! Note: If you’re going to use a regular pair of jeans, bleach goes along way! 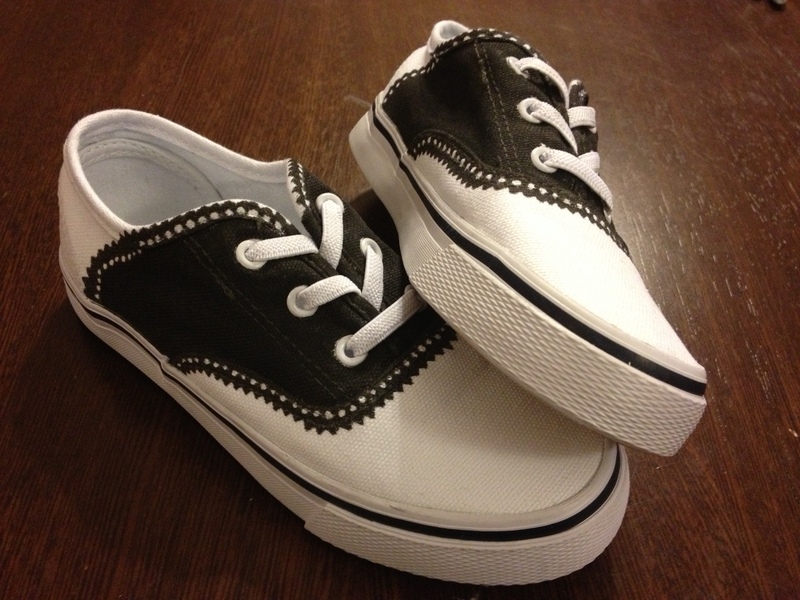 You may have to bleach them a few times but it can be done. 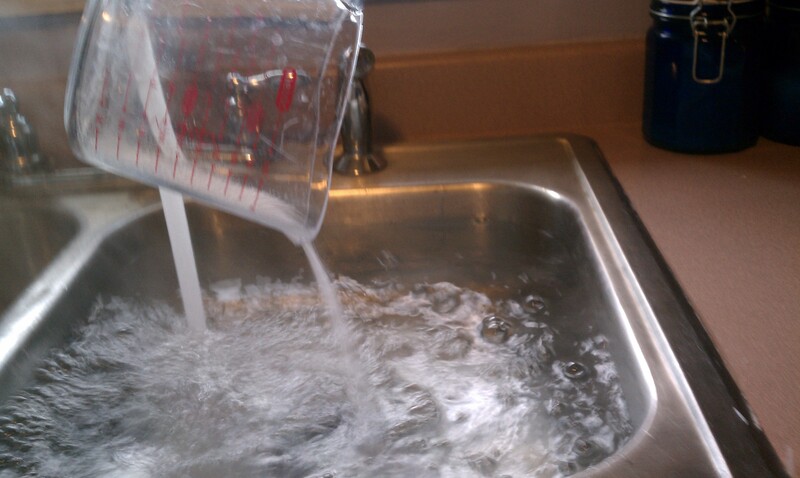 When you’re ready to dye, you should fill a stainless steel sink or bucket with boiling hot water and 1/4 a cup of salt. Next you’ll stir in the dye. Once the dye is all dissolved, it’s time to throw in your jeans! For the first 15 minutes, you’ll stir the jeans in the dye. Depending on the color you’re wishing to achieve, you may want to take you jeans out right away. If you want them to be darker, add about 45 minutes stirring every so often. When you’ve achieved the desired color, rinse the jeans with cool water. 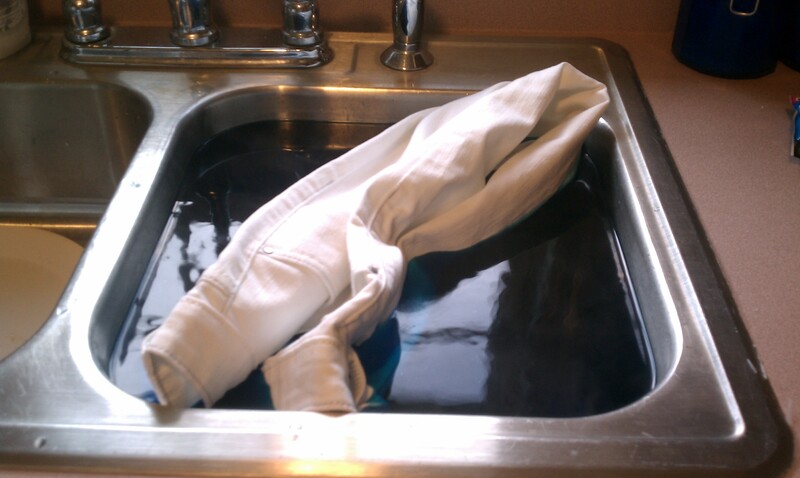 To remove any excess dye, wash jeans ALONE in the washer with warm water. Once you’re jeans are dry you’re ready to wear them out in style! Here is another photo of my finished product. I’m very happy with the way my jeans turned out and can’t wait to wear them! I wish you the best of luck if you decide to try this. Also, don’t be afraid to mess up! If you’re like me, you haven’t worn those jeans you’re thinking of in forever. You have nothing to lose! Once my sister saw the Shabby Chic Window Mirror that I made a few weeks ago, she decided that I needed to make a window item for her as well. Since my sister has two little girls, I decided to make something that they could use also. 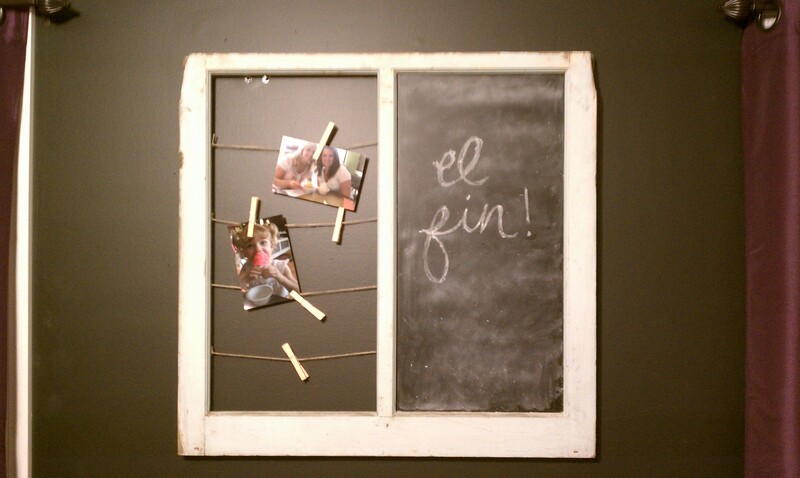 That’s when I had the idea for a chalk board! 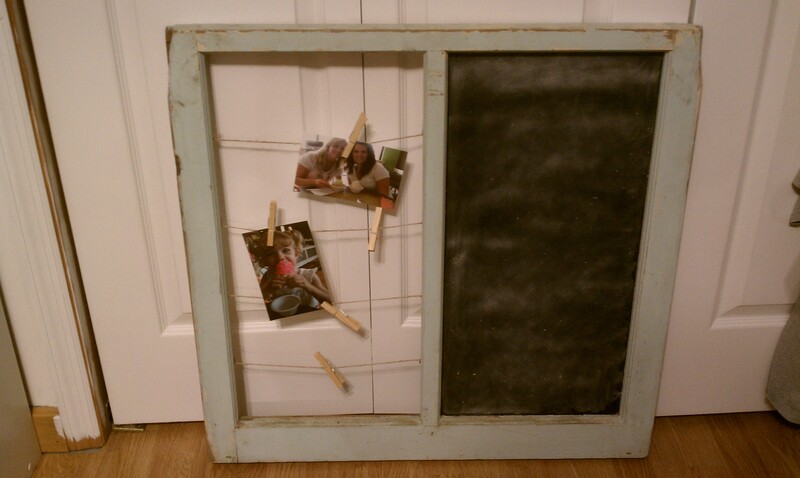 Things you’ll need: An old window frame(with glass in tact), chalk board spray paint, caulk or glue, twine, a nail gun, clothes pins and chalk of course! Here are a few pictures to show you my process. If you have any questions on the method just leave me a comment! I started by sanding down the paint that was chipping off. 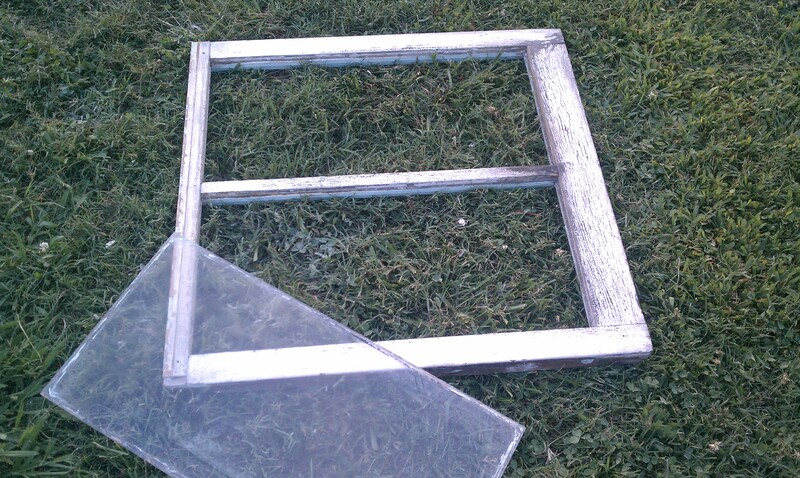 The window I chose had two separate removable panes which proved very helpful. 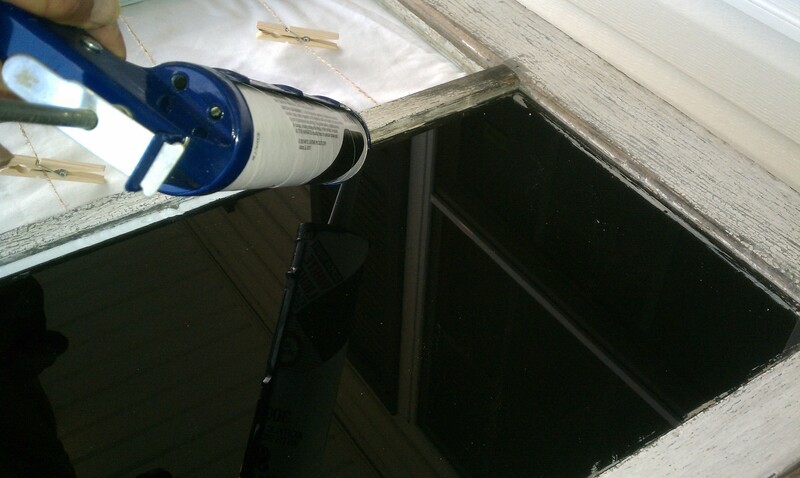 Once I had scrapped off all of the old caulk that was holding the window in, it fell right out. I found this little gem while picking up some craft supplies at Ace Hardware! While my chalkboard paint was drying, I decided to move on to the next step. Once the glue has dried, you’re on the home stretch! 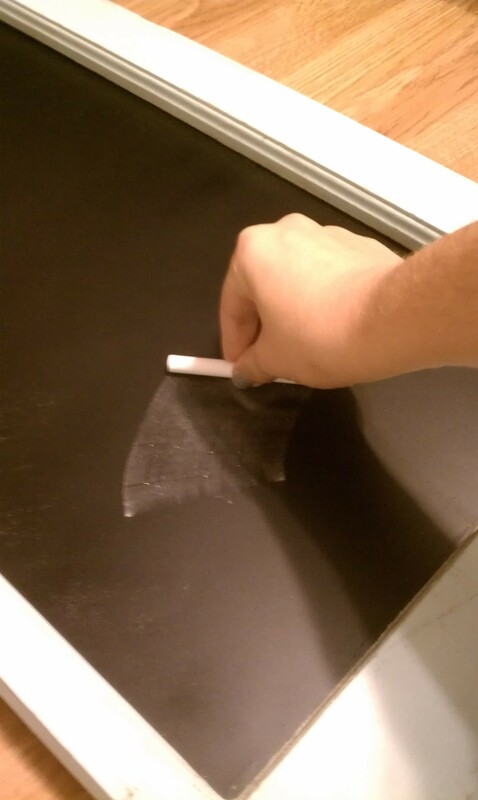 Per directions on the spray paint, in order to “set” the chalkboard, you must first rub the flat side of a piece of chalk over the entire board and then erase it. Here is another look at the finished product. One day, when I find one, I want to attach a silver pail to the bottom right hand corner that will serve as a holder for chalk. If you’re thinking “I would make this….if only I had a window frame,” then let me be the first to tell you…they are all over the place at old second hand shops! I recently added a few more to my collection that were $5 a piece at thrift store here in town. If you decide to give this a go, please post a picture and let me know how it went! 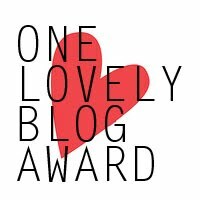 Thanks to Kimberly Ann, I have been nominated for the One Lovely Blog Award! 2. Name 7 things about myself that you don’t already know. • I absolutely love music and don’t know if I could handle one day without it! • A few of my favorite bands are: Death Cab for Cutie, Needtobreathe, Florence + The Machine and Mumford and Sons. • I don’t have any tattoos for fear that I will be addicted. • My favorite colors are mint green and coral. • I love all things antique and vintage. • I have only one sibling, we are nine years apart and she is my very best friend in the entire world. • I want to start my own antique boutique of new things made old! 3. Nominate 5 blogs that I love. 4. Let each person know you nominated them for the award! This morning I decided I wanted to do something new with my nails. 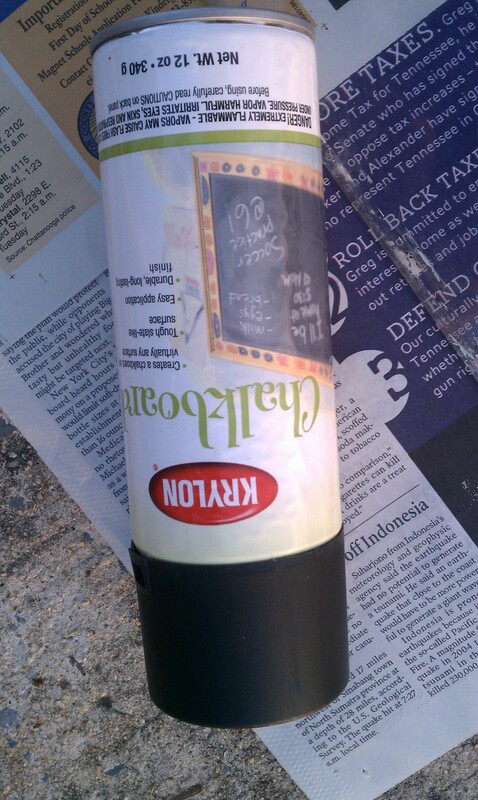 I had heard through the grapevine that you could use rubbing alcohol to transfer news print onto surfaces. Here goes! 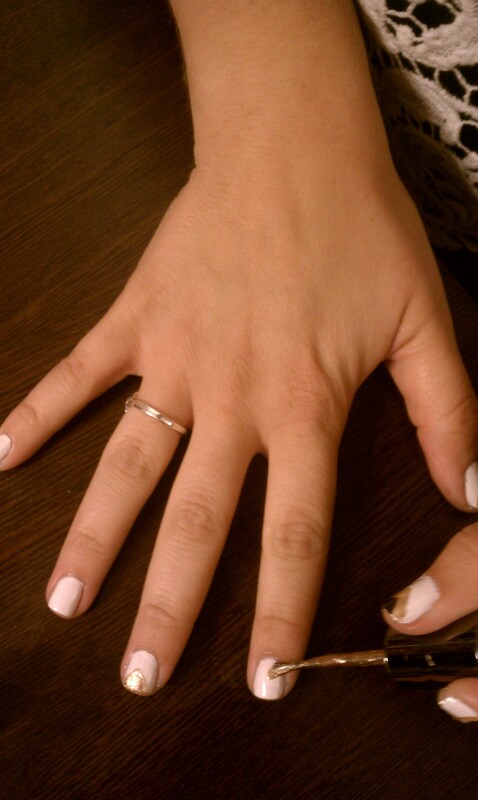 To begin, I applied a clear coat to protect my natural nails. Once the clear coat had dried, I then applied a coat of light gray. 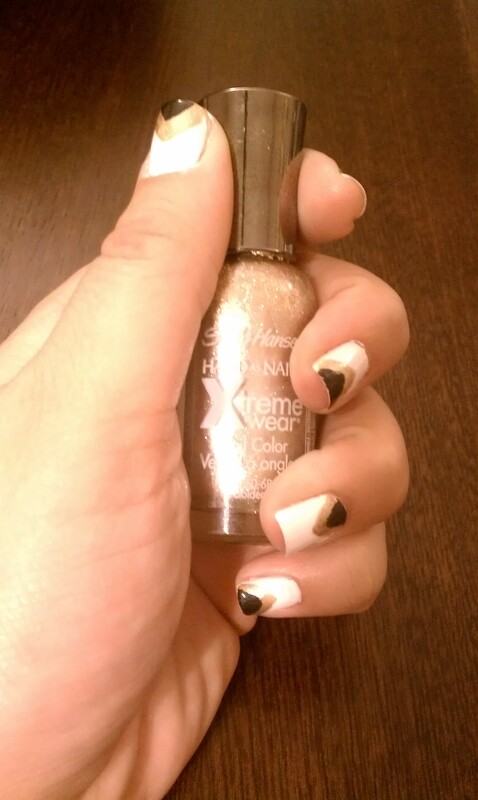 I chose a light gray so that the nails would actually look like a newspaper. 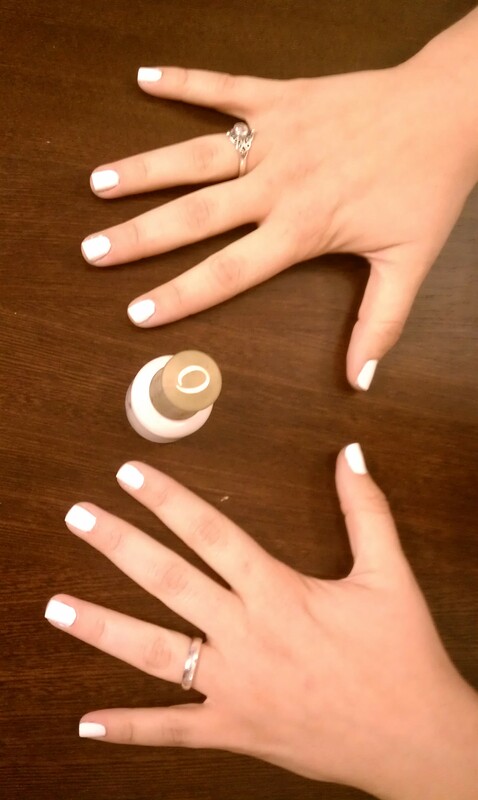 Tip: If you’re going to try this, make sure before starting another step that your nails have completely tried. 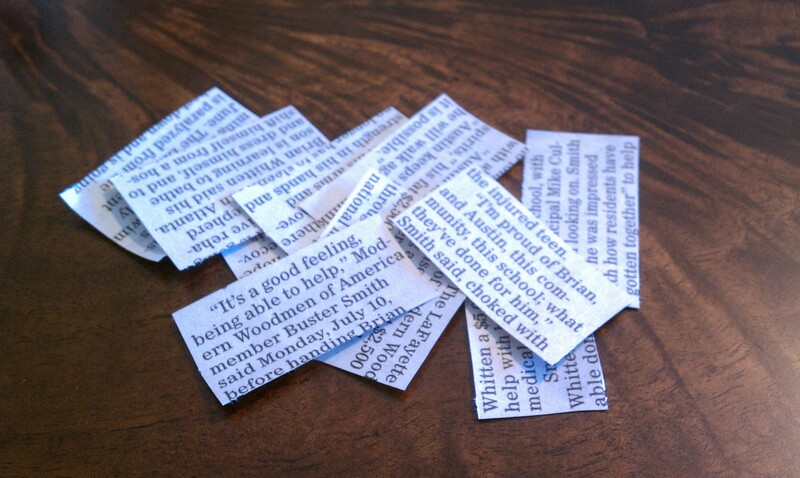 I thought at this point, I should go ahead and have newspaper pieces cut out and ready to use. 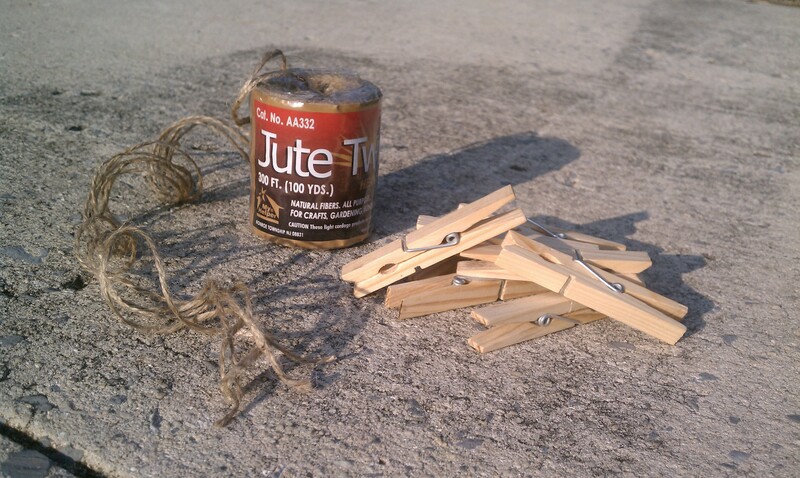 This is the one time I’ll deter recycling, it’s best to start with a fresh piece for each nail. 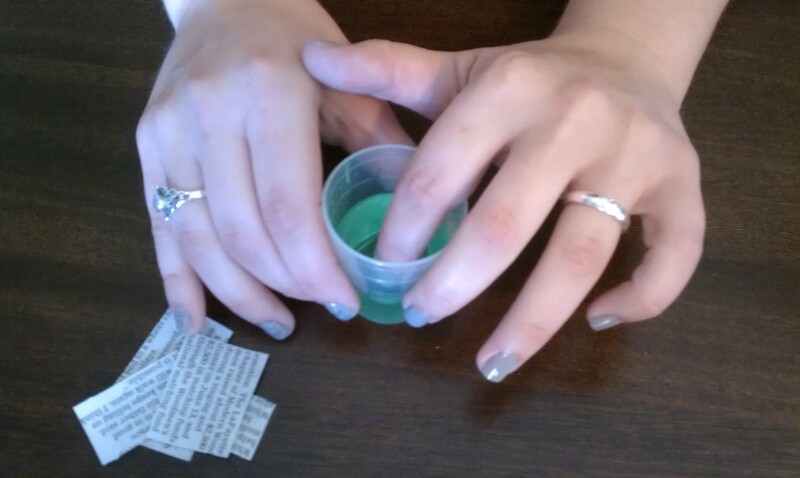 Once my nails were completely dried, I dipped my finger in rubbing alcohol. 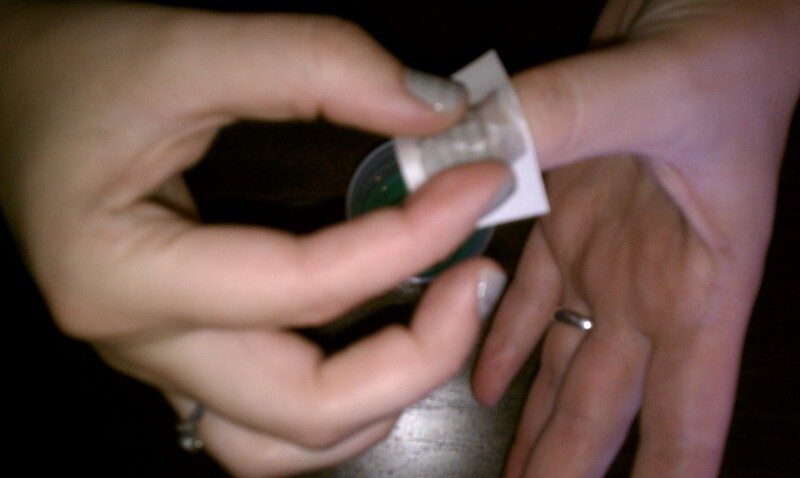 You should leave your finger in the rubbing alcohol for about 5 seconds. 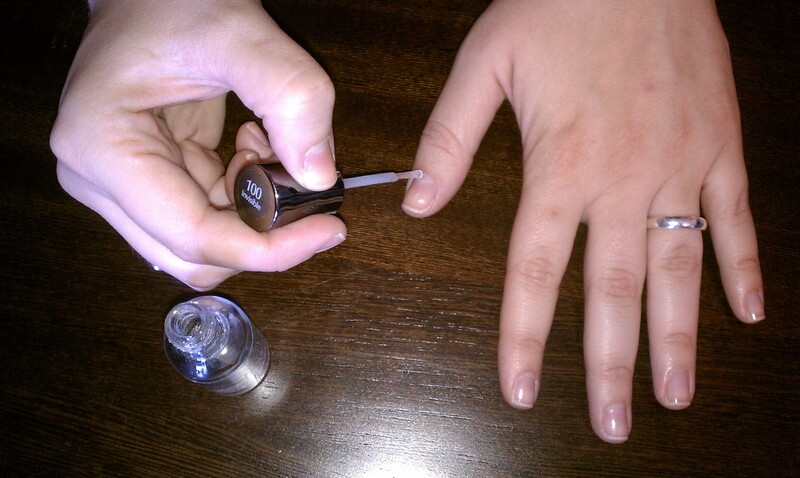 Immediately after dipping my nail in the rubbing alcohol, I placed a piece of newsprint on the nail. 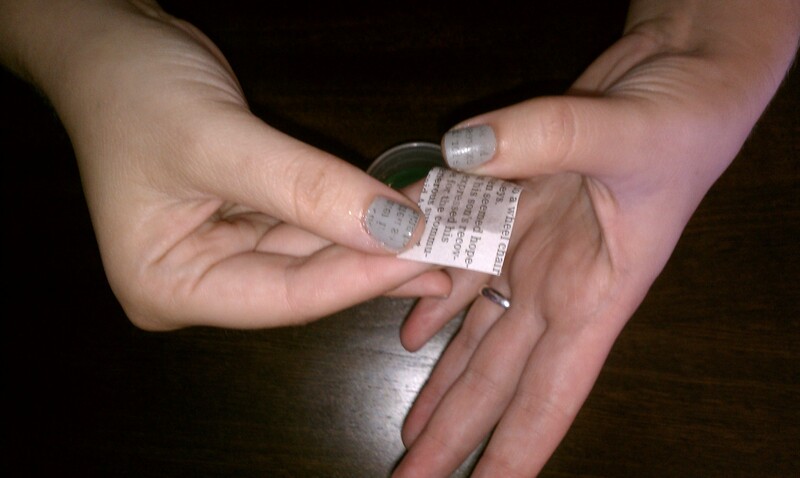 I found that 15 seconds was a nice time frame for holding the print on your nail. 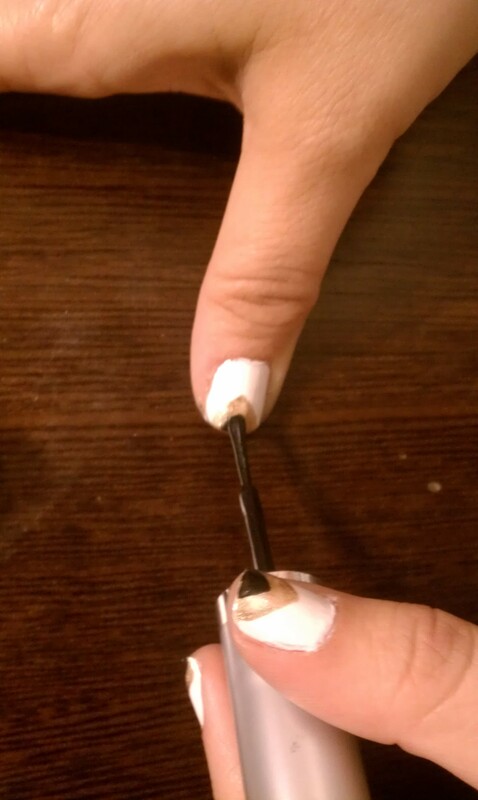 Tip: This step works much better if your nail is dripping wet! When I first tried this look, I shook the alcohol off and then held the newspaper to it. Sadly, the newspaper stuck to my nail…wah wah. After 15 seconds had passed, I pealed off the newsprint and viola! I quite literally had the news at my finger tips! Try out this look! It’s very fun and looks awesome! This past week a friend and I took a trip to Nashville for his birthday to see Death Cab for Cutie for the second time. This is a photo from when we saw them last year. Who knew you couldn’t pictures at the Ryman? 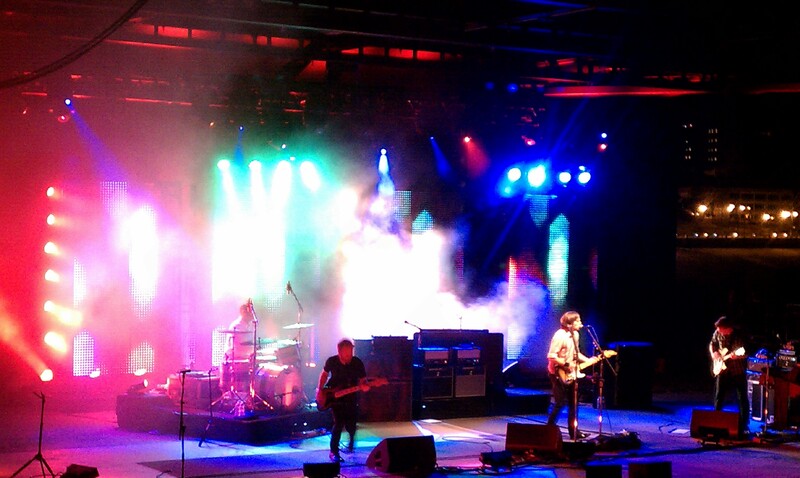 Death Cab for Cutie at Mud Island Amphitheater in Memphis, TN. While we there, some friends and I went to the Goodwill Outlet to see what we could find. 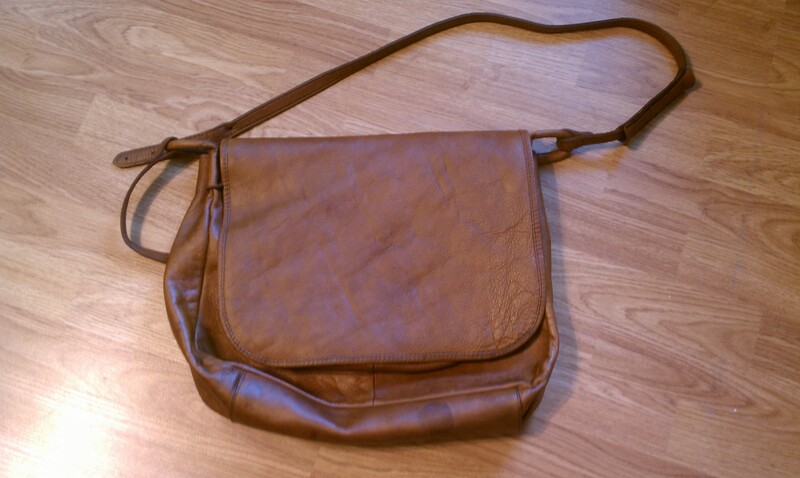 Not too long after we had been there I found this awesome leather bag for $2! The bag was kind of stained and not really my favorite color. 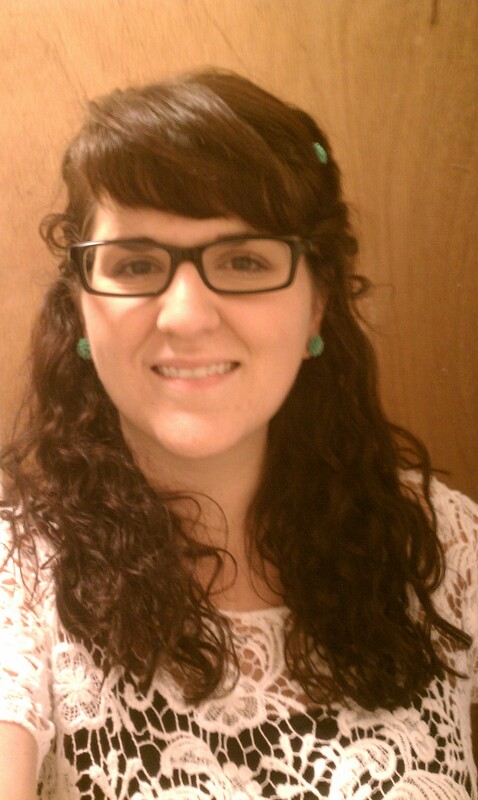 I soon decided that I would try to dye it! I was a little worried because I’ve never tried to dye leather. 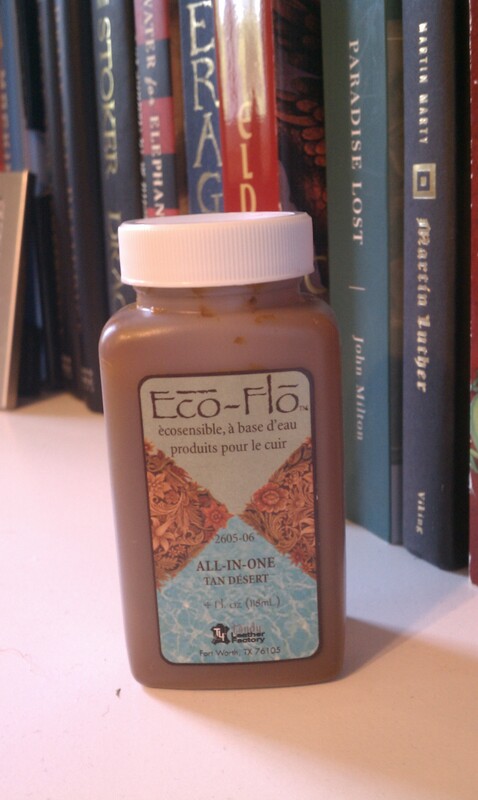 I went to Hobby Lobby and purchased “All-In-One” Tan leather dye for about $3. 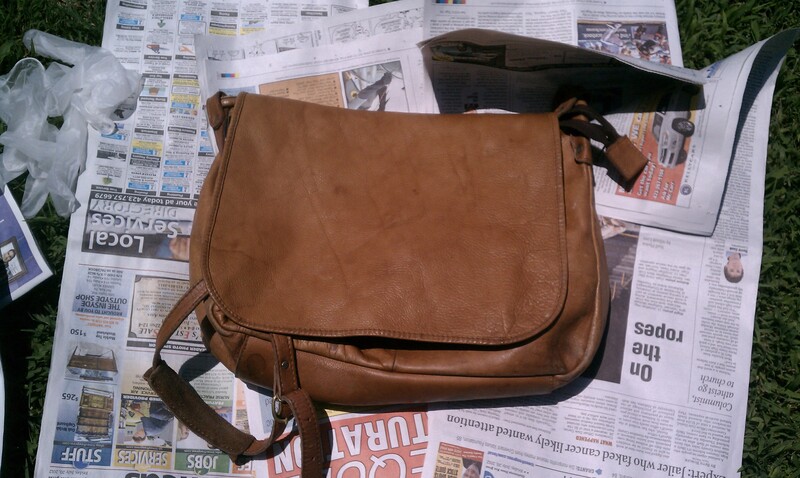 As it turns out, leather dye is extremely easy to use! All you do is wipe it on the leather and it immediately soaks into the fabric. I continued to apply coats to achieve the desired color. Once I thought I’d succeeded, I let the bag dry thoroughly outside. Helpful hint: If you’re using leather dye, make sure and wear gloves! A no-brainer I’m sure; however, I had a hole in my glove and still have a brown spot on my finger! 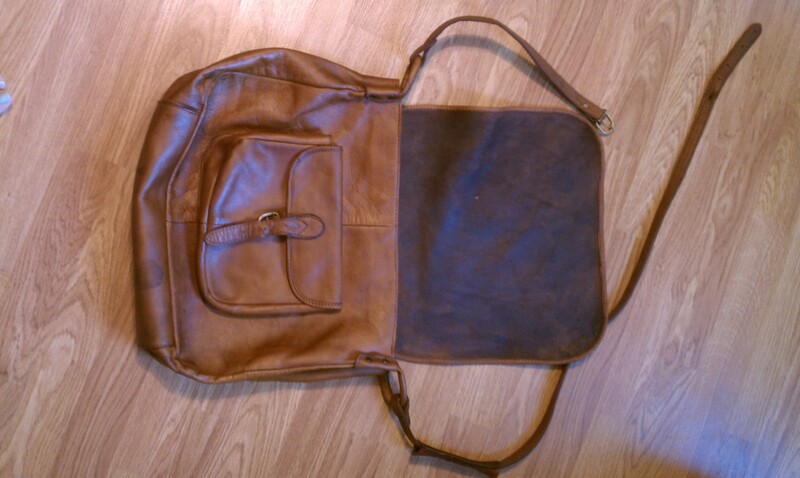 This is the bag completely dyed. I knew it would make it look cleaner, but I had no idea it would make the bag feel different. The bag was pretty warn to begin with but once I’d dyed it, it felt much thicker! 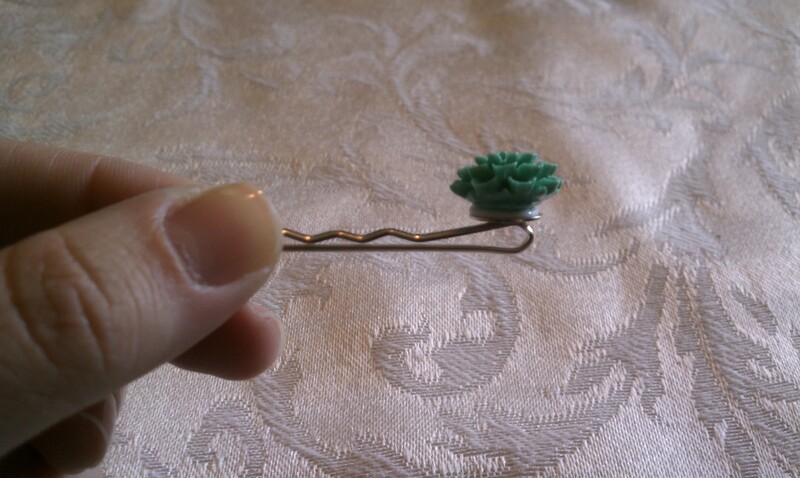 While I was at the Hobby Lobby, I found this awesome charm for a necklace. It was half off at the time so I decided to get it and decide later what I’d do with it. After I started looking at the bag, I thought it needed something else. That’s when I remembered the charm I’d bought! 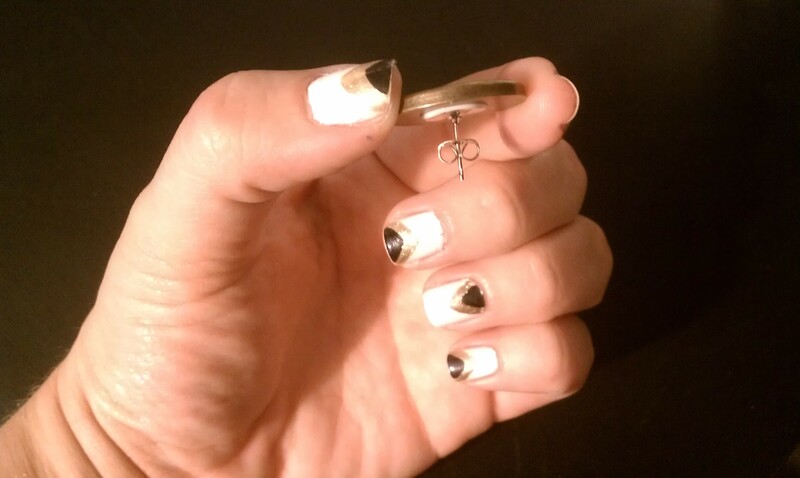 I used a thimble to help carefully make holes with a needle in the thick leather and then sewed the charm on using the jewelry rings. 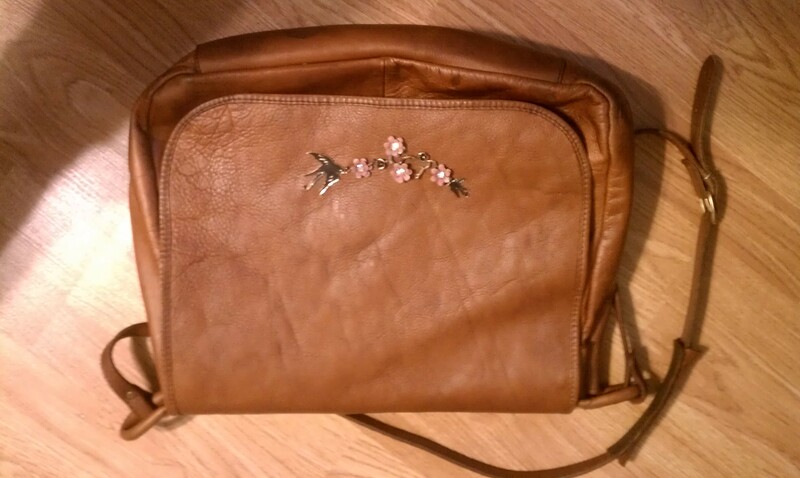 This has quickly become my favorite bag. And the best part is…it cost me less than $10!